TV viewers love their zombies and last season, Z Nation was the highest-rated series on Syfy. Will the series continue to bring in positive ratings in season two? Will it be renewed for a third season or, will it be cancelled instead? Stay tuned. A horror TV show, Z Nation begins three years after a zombie virus has gutted the United States. A ragtag band of everyday people must work together to cross the country with a possible cure for the apocalypse. The cast includes Kellita Smith, DJ Qualls, Keith Allan, Matt Cedeno, Anastasia Baranova, Russell Hodgkinson, Michael Welch, Pisay Pao, and Nat Zang. 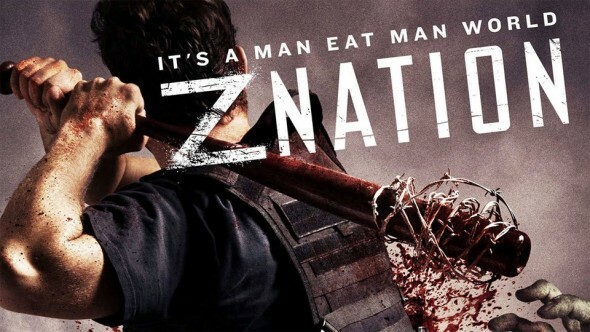 11/6 update: Syfy has renewed Z Nation for a third season. Details here. Final season averages: 0.33 rating in the 18-49 demographic with 880,000 total viewers. For comparisons: The first season of Z Nation averaged a 0.48 rating in the 18-49 demographic with 1.42 million viewers. What do you think? Do you like the Z Nation TV series? Do you think it should be cancelled or renewed for a third season? One of the best show,s I have seen in a long time I think I like it better than the walking dead! Since the show did not go through a sophmore slump but instead built upon its premise, I will be very interested to see if they can keep up the high level of cleverness in the writing. I even offered the producers of Z Nation to work for scale. It didn’t go into a sophmore slump? The ratings DROPPED FROM SEASON ONE TO SEASON TWO! What the heck is that? Are you trying your hand at creating new meanings for words and expressions? Stop right now. You better hope the ratings don’t tank in season three like 12 Monkeys ratings tanked this season. After Season 6 of the Walking Dead, anything is better than that. But Z Nation is a great show in its own right, when I don’t have plans, the show just makes my Friday nights. The season finale was one of the best I have ever seen…….. It was such a cliffhanger. Like what happens to 10k, what’s gonna happen when Murphy reaches the shore, who are those guys with the guns, and the most important one for me is the ending which shows Murphy’s daughter,Lucy, she might be one of the main characters next season. Can’t wait for season three to come out!!! !